For this recipe you can use one of these fillings. Put the ingredients in a bowl or plate and mix them. Place the oil and ground beef in a pan and cook until the meat changes in color. Then add the onions and sauté for 2-3 minutes over low-medium heat. Add the tomatoes or tomato paste and salt. Cook for 6-8 minutes over low heat and stir occasionally. Finally add black pepper and cumin. If you are using frozen spinach do not thaw. On the other hand, if you are using canned spinach, drain it. For the fresh spinach, wash, drain and chop. Place the oil and chopped onions in a pan and sauté for 2-3 minutes on low-medium heat. Add the spinach, salt and cook for 8-10 minutes with the lid closed but stirring occasionally. When it’s done, sprinkle black pepper (optional). Cut the leeks lengthwise and chop thinly. Then place them in a skillet with oil and salt. Cook over medium heat till leek absorb all its juice. Add parsley (optional) and feta/ricotta cheese (optional) and mix them all. In a skillet, saute onions, oil and ground beef (optional) over low heat. Chop eggplants finely and stir into the skillet. Add paprika and salt, then cook till eggplants are soft and tender (10-12 minutes). In a bowl place the eggs, oil and milk. Mix them with a whisk. You will use this mixture between every two or three layers of the pastry and on top of the borek. After greasing the Pyrex dish, place two or three layers of pastry/ 1 yufka on the bottom and let it go over the sides of the dish. Spread 3 tbsp of the mixture on it and put some of the filling you are using and spread it evenly. Take the other 2-3 sheets of pastry and wrinkle them up in order to fit to the dish (see the picture). Continue layering in the same way; first the liquid mixture and then the filling. When you place the last pastry sheets, fold the sides of the bottom sheets over. Pour the remaining liquid mixture on top of the borek and sprinkle nigella and sesame seeds. Preheat the oven to 350 F(180 C) and cook for about 45 minutes, until it turns golden brown. Serve warm. Bu tarif icin asagidaki malzemelerden istediginizi kullanabilirsiniz. Bir tavaya sivi yagi ve kiymayi koyup, kiyma renk degistirene dek kavurun. Sonra soganlari ilave edin ve 2-3 dakika orta ateste kavurun. Domatesi/ domates salcasini ve tuzu ilave edin.Kisik ateste 6-8 dakika boyunca ara sira karistirarak pisirin. Son olarak karabiber ve kimyonu ilave edin. Eger dondurulmus ispanak kullaniyorsaniz, cozundurmeden kullanin. Diger yandan eger konserve kullaniyorsaniz suyunu suzun. Taze ispanagi yikayip, dograyin. Bir tavada yag ve soganlari 2-3 dakika orta ateste kavurun. Ispanagi ve tuzu ilave edin ve ara sira karistirirak, kapagi kapali olarak 8-10 dakika pisirin. Hazir oldugu zaman uzerine karabiber serpin (istege bagli). Bir tencerede patatesleri haslayip, ezin. Bu sirada bir tavada sivi yag ile soganlari orta ateste 2-3 dakika boyunca kavurun. Sonra salcayi, tuzu ve patatesleri ilave edin. Karistirarak 5-6 dakika pisirin. Son olarak isterseniz karabiber ve kimyon ilave edin. Pirasalari uzunlamasina kesin ve ince ince dograyin. Sonra bir tavada sivi yag ve tuz ile birlikte, pirasalar suyunu cekene dek pisirin. Maydanoz ve beyaz peyniri ilave edin (istege bagli), hepsini karistirin. Bir tavada yag ile sogan ve kiymayi (istege bagli) kavurun. Patlicanlari kucuk kucuk dograyin ve tavaya ilave edin. Tuz ve kirmizi biberi de ilave ettikten sonra; patlicanlar yumusayana dek kisik ateste pisirin (10-12 dakika). Bir kasede sut, yumurta ve sivi yagini karistirin. Bu karisimi her 2-3 tane pastry arasina/her yufka arasinda ve boregin ustu icin kullanacaksiniz. Tepsiyi yagladiktan sonra, 2-3 tane pastriyi/1 yufkayi tepsinin dibine kenarlari tepsinin disarisina cikacak sekilde yayin. 3 yemek kasigi sut karisimindan yayin ve kullandiginiz icten bir miktar alip esit sekilde yayin. Diger 2-3 pastriyi/ 1 yufkayi burusturarak tepsinin boyutlarina gore yerlestirin ve yine sutlu karisim ve icten koyarak elinizdeki pastri/yufka bitene dek bu islemi tekrarlayin (resime bakiniz). Son pastri/yufkayi koyunca, en alttaki yufkayi tepsinin icine dogru kivirip boregin uzerini ortun. Geriye kalan sut karisimini esit sekilde boregin uzerine dokun ve susam ile corek otu serpin. Onceden isitilmis 180 C (350 F) firinda, uzeri kizarana dek, yaklasik 45 dakika pisirin. Sicak servis yapin. Thanks for this recipe. It is very delicious. I recommend this delicious borek to everybody. 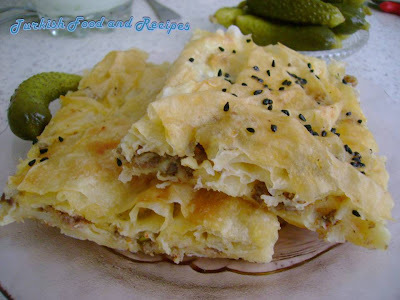 I found this Borek post by following a link from today's recipe for Water Borek (Su Boregi). 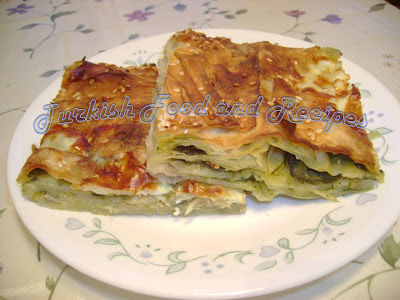 We have eaten Borek bought from our local Turkish shop and I am glad to have a recipe for it. I will be having a go at one of these fillings. Thank you! Thanks for yet another delicious recipe - I use this site all the time FABULOUS !!!!! Hi, This is very nice blog, thanks! I would like to print your loooong recipes, or copy to my book, I could not do it! Is there a way? Do I have to write down your extensive recipe? I am from Romania, from greek ancestors, i make folly dough often! I like your fillings.... I use fetches and spinach mostly.... I had some aunt who use your filing, I didn't know recipe, thanks for it! Please tell me I don't have to write down your loooongggg recipes! !